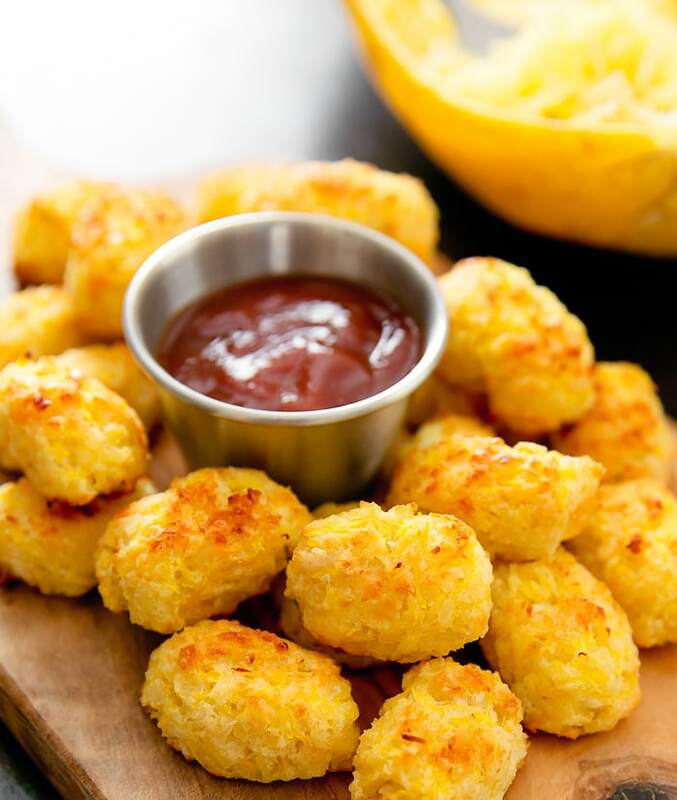 These spaghetti squash tots are a healthier and delicious alternative to traditional tater tots and a great way to get an extra dose of vegetables into your diet. I wasn’t kidding when I said that I’m currently obsessed with spaghetti squash right now. 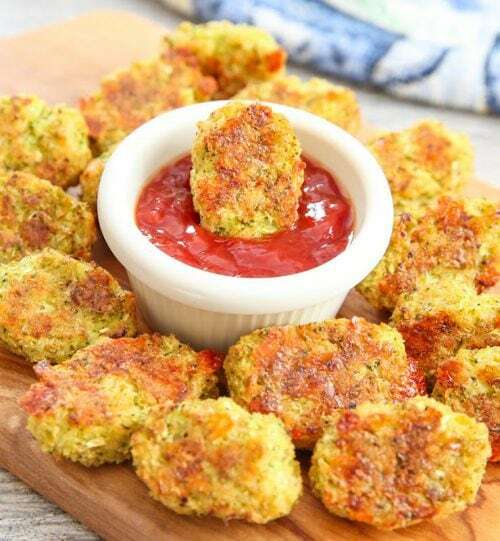 So far I’ve made cauliflower tots, zucchini tots and broccoli tots. 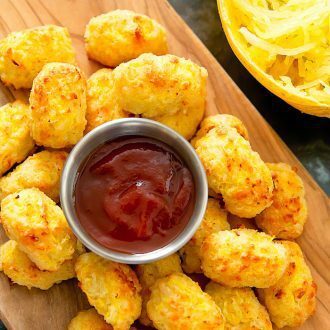 So why not spaghetti squash tots? These are actually easier to make them some of the other vegetable tots because the spaghetti squash doesn’t retain as much water. These bright yellow morsels were so good! I only made a small batch, but if you’ve got a lot of mouths to feed, you’ll probably want to double or even triple the recipe. If you’re unfamiliar with cooking spaghetti squash, I have a step-by-step tutorial here. 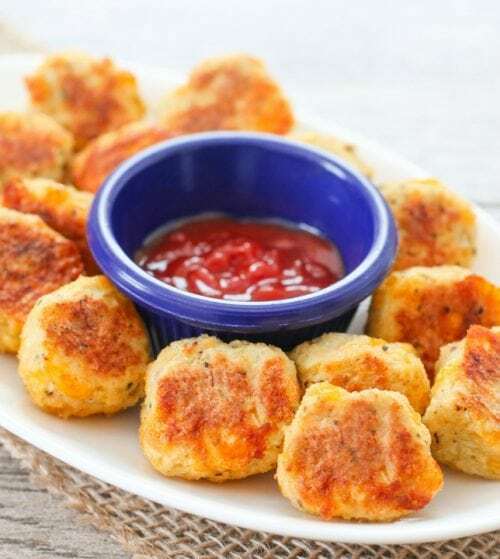 A healthier alternative to tater tots, these tots are baked and filled with spaghetti squash and cheese. 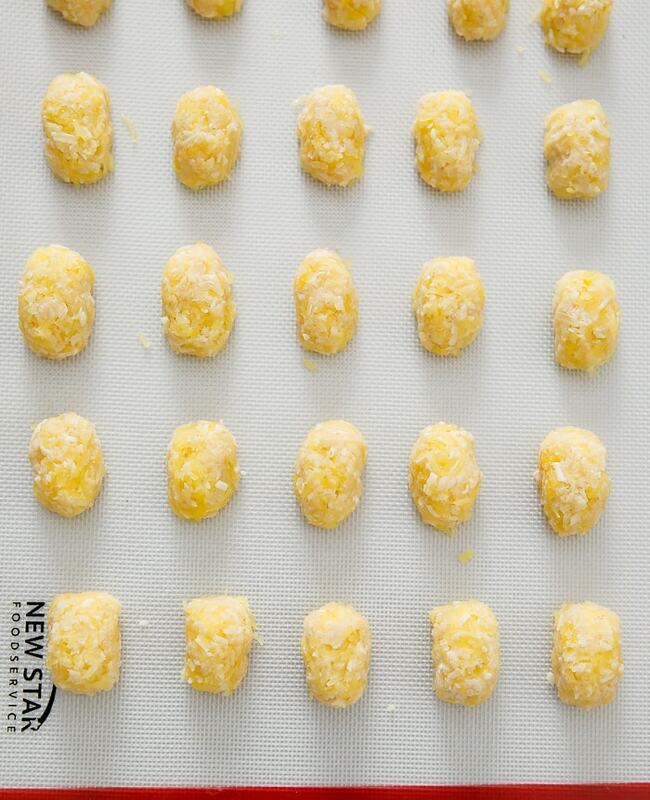 This recipe makes about 25 tots and can be doubled or tripled if you're serving more people. 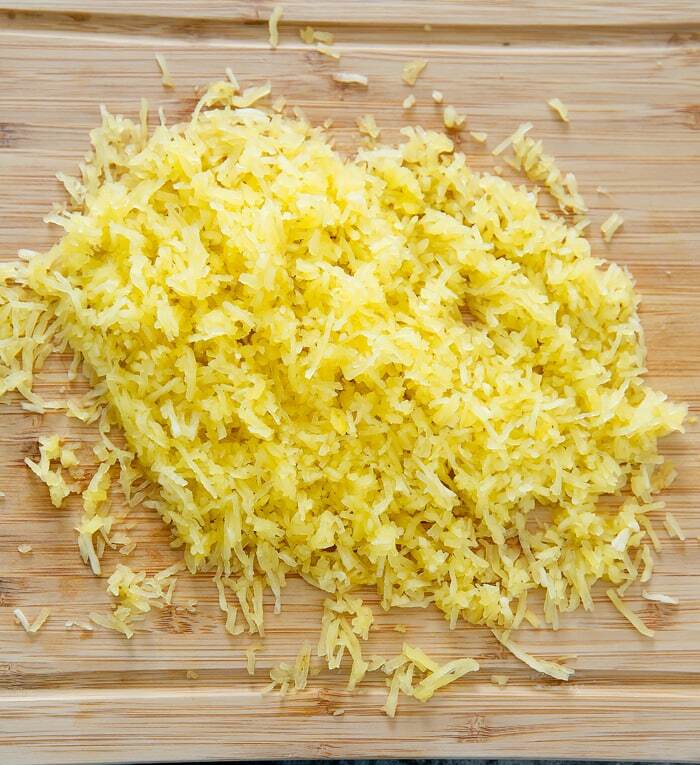 Roughly chop spaghetti squash into small pieces so that it resembles shredded squash. In a large bowl, add all ingredients. 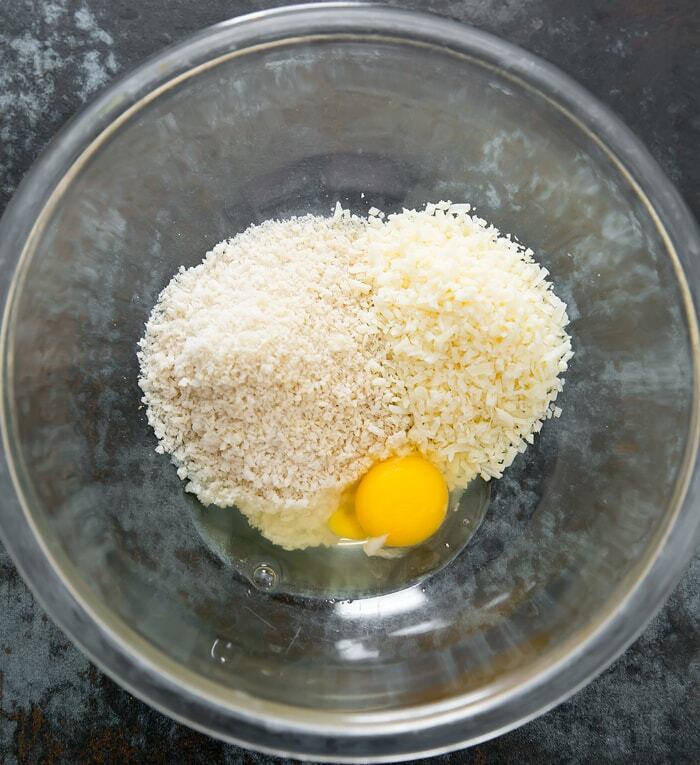 Mix with a spoon until everything is thoroughly combined and all the of the mixture is moistened. Preheat oven to 400°F. Line a large baking sheet with parchment paper or silicone baking mat. 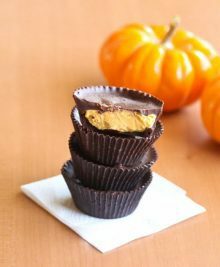 Scoop 1 tablespoon of squash batter and squeeze tightly between the palm of your hand a few times. This should release some liquid which will further moisten your mixture as well as allowing the mixture to compact and stick together easily. Gently shape to resemble a cylinder. Place onto a baking sheet and repeat with remaining mixture. Space tots about 1/2 inch apart. You should be able to make about 25 tots. Bake for about 18-20 minutes until bottoms are golden brown and crispy. Flip over and bake for another 3-5 minutes. 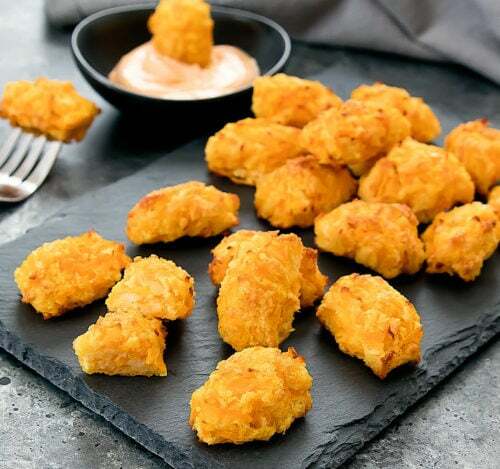 Serve warm with dipping sauce of your choice. If you're unfamiliar with cooking spaghetti squash, I have a step-by-step tutorial here. Please use panko for best results. If you use regular breadcrumbs, you will need to use less. I LOVE this1!1 What a genius idea Kirbie. I can’t wait to try this recipe. Is there a way to make this even more low carb without the panko ? I recently saw the almond flour at Trader Joes – could that be a substitute for the panko (I know texture won’t be same). I wonder if you could deep fry these taters too?! I’m not sure how well they will hold together with almond flour but you can definitely experiment. I had the same thought… made some crab cakes tonight with almond flour and it worked well. Gonna give the almond flour a try with these, too! Thank you! Great recipe! I hope they work out well! You could try crushed pork rinds, or toasted (baked) and crushed low carb tortilla. I made these last night using oatmeal flour instead of bread crumbs. I used 3/4 cup oatmeal flour (just put rolled oats in the blender to make the flour) and I really squeezed out the moisture in the squash with my hands. I added a quite a bit of salt and pepper. They turned out a little soggy still, but they held their shape and tasted pretty good. 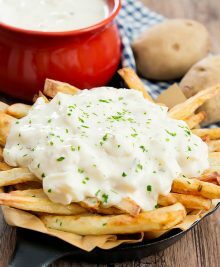 This recipe turned out be a good recipe, a good low carb tator substitute! The oat flour likely doesn’t absorb the liquids as well which is why they were a little soggy. Thanks for sharing though! These look delicious. 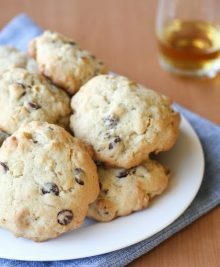 Do you think it is possible to make these vegan? If so, how would you recommend doing it? 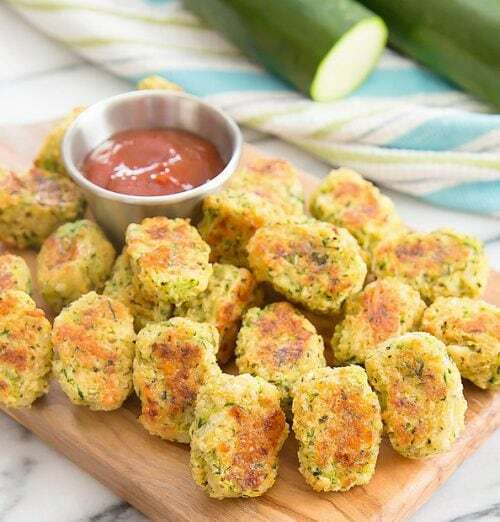 What is zucchini batter? I’m thinking you meant squash but just thought I’d ask for clarification on the off chance that I’m wrong..
yes that should say squash batter! Sorry about that! These were soooooo good. 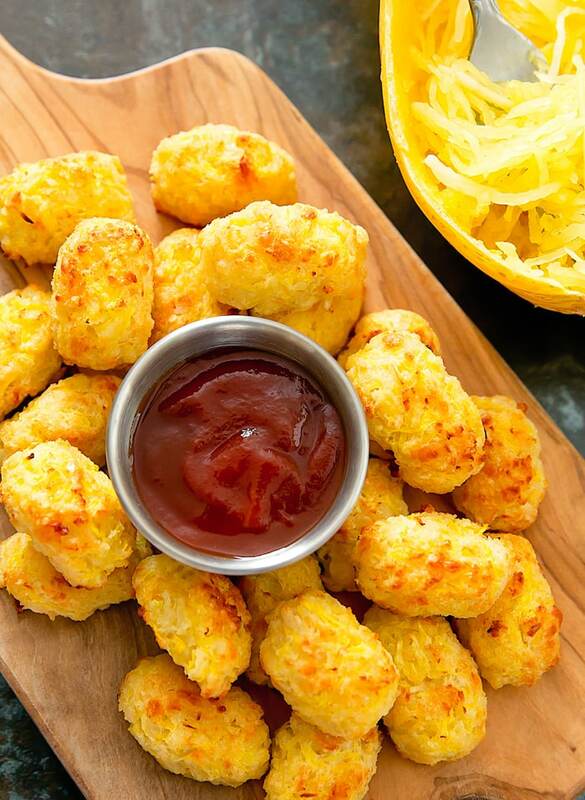 Great choice for the healthy version of ‘Tators Tots’. Would love to know if you could freeze these? Very time consuming, but so yummy! i havent tried to freeze them, but I imagine it should freeze well! 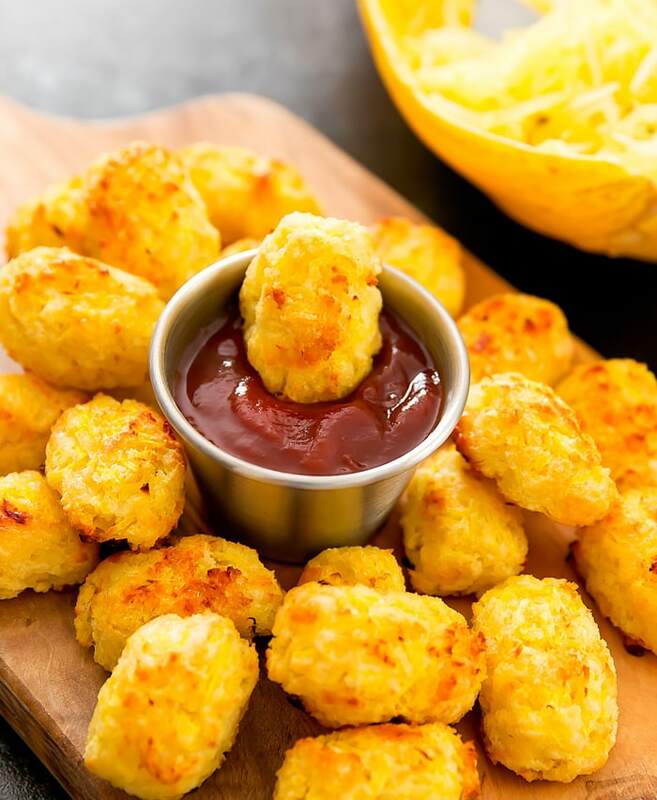 Would you have any idea about the nutritional value of these “tots”? These look absolutely delicious!! I was wondering if they could be deep fried? I have not tried, but I think so! yikes! at least you caught it before you actually made 11 1/2 cups of spaghetti squash! Just wondering if it’s safe to freeze them? If so, which way would be best to do so; cooked thoroughly or before placing them into the oven and then freeze? I have not tried freezing, but I would guess that they would freeze well, both either uncooked or cooked. Love them! Thanks for a new idea for spaghetti squash!